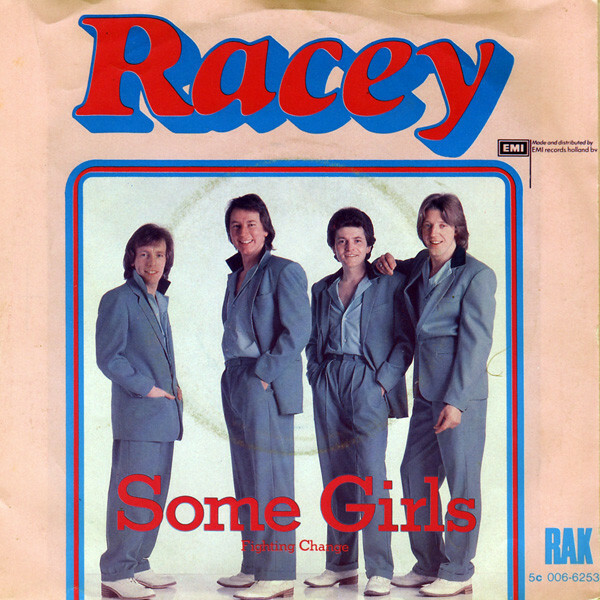 Racey’s ‘Some Girls’ clocked up its 4th straight week at 1, seeing off the challenge from Chilly’s ‘For Your Love’ which sat at 2 for a second week and Supertramp’s ‘The Logical Song’ which climbed 1 from 4 to 3. ‘Some Girls’ clocked up the 260th week at 1 for a song by a British act. Joe Dolan picked up his 3rd climber of the week award with an 11 place climb by ‘My Love’ which moved up from 15 to 4. This was the 6th time in 1979 that we had seen a song climb 11 or more places and this was a new record for a calendar year. The previous best of 5 was seen in 1968. Overall 41 songs had seen a climb of 11 or more in a week. Three other songs made star rater climbs and these were Buffalo featuring Peter Vee’s ‘Magic Carpet Ride’ (which was last week’s climber of the week) which climbed 6 from 11 to 5, Blondie’s ‘Sunday Girl’ which climbed 6 from 14 to 8 and Century’s ‘The Face In The Mirror’ which climbed 6 from 20 to 14. Promises’ ‘Baby It’s You’ was the faller of the week with a 6 place drop from 10 to 16. The oldest song on last week’s chart was the first of 4 to leave the top 20 this week. Frankie Miller’s ‘Darlin’ spent 20 weeks in the top 20 and peaked at 6. This was the lowest peak so far for a song lasting 20 weeks or more in the charts. The previous lowest peak was 5 which Double Vision’s ‘Maori Love Song’ managed. This would be Miller’s only SA chart hit. The new oldest on the top 20 was Abba’s ‘Chiquitita’ which was on 18 weeks. Boney M’s ‘Hooray! Hooray! it’s a Holi-Holiday’ lasted 10 weeks and peaked at 12. It was the first of their 6 hits to date that did not make the top 10. All of their hits made at least 10 weeks in the charts except ‘Rasputin’ which only managed 7. They had more hits to come. Anton Goosen’s ‘Kruidjie-Roer-My-Nie’ lasted 16 weeks in the top 20 and peaked at 10. This would be his only SA chart hit as an artist and his last as a song writer. Overall he had seen 4 of his compositions chart which had clocked up a total of 41 weeks with Gene Rockwell’s ‘My Life’s In Good Hands (Jesus, Sweet Jesus)’ giving him his highest peak of 8. Last to go was Blondie’s ‘Heart Of Glass’ which managed 17 weeks and peaked at 2. Their run with 2 in the charts only lasted the 1 weeks as their other hit, ‘Sunday Girl’ had been a new entry last week. Anita Ward’s ‘Ring My Bell’ was the first of the new entries. The song had originally been written for Stacy Lattisaw (who as 11 at the time) to record but, as she changed record labels just at that time, the song was offered to Anita instead. It would go on to become a worldwide smash hit, going to number 1 in Canada, New Zealand, Norway, Spain, the UK and the US, shifting over half a million units in the UK. Anita would only have 1 other hit make the US charts in the form of ‘Don’t Drop My Love’ which made it to 86 there. ‘Ring My Bell’ has been her only UK chart hit to date. Our second new entry was by an act that would be the only one to chart where their name was only 1 letter and that was M with their hit ‘Pop Muzik’. M was essentially a guy called Robin Scott. ‘Pop Muzik’ would give him a number 1 hit in Australia, Canada, Denmark, Germany, Sweden, Switzerland and the US. In the UK it went to 2, kept off the top spot there by Art Garfunkel’s ‘Bright Eyes’ (which was at 15 this week on our charts). ‘Pop Muzik’ would go on to be covered by none other than U2. Scott himself would go on to record and album called ‘Jive Shikisha’ with a South African band called Shikisha which was released on 1998. Abba saw their 14th hit make our charts this week in the form of ‘Does Your Mother Know’. They were the 6th act so far to see this many hits chart and they sat tied 5th overall for hits alongside Elvis Presley. ‘Does Your Mother Know’ was one of the few Abba songs that featured Bjorn Ulveaus on lead vocals instead of Agnetha and/or Frida. Like our other new entries this week, it would also make it to the top of the charts in a number of countries although these were only Germany and Belgium, far fewer than the other 2 mentioned above. It would peak at 2 in Canada and Finland. In the UK it would make it to 4 and would be one of 10 of their songs that would make the top 20 in the US, peaking at 19 there. As mentioned above, Abba’s previous hit, ‘Chiquitita’ was the oldest on this week’s chart and they became the 66th act to see 2 or more in the charts in the same week. The final new entry was Kiss’ ‘I Was Made For Loving You’. We had already seen band member Ace Frehley chart (with ‘New York Groove’) but this was the first SA hit for Kiss. The single would shift over a million units in the US, but would only make it to number 11 there. It fared better in terms of chart position in Belgium, Canada and The Netherlands where it topped the charts. As with Ace Frehley’s solo hit, we also saw South African born Anton Fig playing the drums on this hit. With Kiss having a new entry and Abba now having 2 in the charts we had a record equalling 3 hits by acts whose name was 4 letter’s long. It was the 12th week where we had seen this. We had now seen 533 songs by American acts chart and 498 by British acts and the gap of 35 between these 2 nations was the highest we had seen so far. Germany caught up with Australia for weeks in the chart by acts from nation. The 2 countries sat tied 6 overall with 198 weeks each. For a 4th week running we saw an act have their total weeks count reach the 20 week milestone. Over the last 3 weeks Supertramp, Eruption, Art Garfunkel and Frankie Miller had got there and this week it was The Doobie Brother’s turn. Also reaching a milestone was Abba who passed the 180 weeks mark and moved on to 181 as they had 2 in the chart. They were now just 4 weeks behind second placed Tom Jones who was on 185. We now had 7 songs in the top 20 that had topped either the UK or US charts or both and this was the highest this total had been since 16 June 1978, 59 weeks previously. Those songs that had topped the charts in one or both of the UK and US were Gloria Gaynor’s ‘I Will Survive’ (both), Blondie’s ‘Sunday Girl’ (UK), Amii Stewart’s ‘Knock On Wood (US), Anita Ward’s ‘Ring My Bell’ (both), The Doobie Brothers’ ‘What a Fool Believes’ (US), Art Garfunkel’s ‘Bright Eyes’ (UK) and M’s ‘Pop Muzik’ (US).